Of all the factors that contribute to good grilling, proper temperature control is probably the most important. However it’s also one of the most challenging to master. In my guide to using charcoal grill vents, I’ll show you exactly how to control the internal heat of your grill. Grilling is all about temperature. And nowhere is this more true than with charcoal grilling. Your charcoal grill essentially has two fuels. One is the coals sitting in the chamber. The other is the oxygen flowing through it. Control of both is hugely important to the success of your cooking. The key lies in whether your vents are set open or closed, and knowing when to set them. They’re not just a chimney or exhaust for heat to escape, but instead a way for you to directly control the temperature in your grill. Using your grill vents comes down to three key stages: The first is to fully open both the upper and lower to feed your charcoal with oxygen. The next is to partly close them to keep the heat at a consistent 225°F (107°C). The last is to close them completely in order to allow the heat to die out. The first thing to say is that this strictly for charcoal grills. 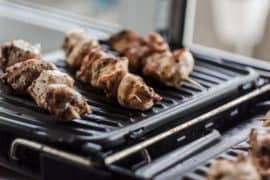 If you have a gas grill, the way that these work is entirely different to charcoal grills and control of their vents isn’t as key to regulating internal grill temperature. This is because the majority of gas grills come with built in controls that aid fuel supply more directly. With charcoal grills, we need to take a lot more care with our vents. The vents are a way of feeding your grill with oxygen, and the key thing to remember is that the wider open they are, the more oxygen is being supplied to your charcoal. In turn this means more heat. If you close the vents then you cutting this supply, and therefore allowing less heat. To get the most out of this you will also need a good grill surface thermometer. For me, there are three main stages to using a charcoal grill in which you will need to adjust your vents’ settings. When starting your grill, we need to expose the inside of the grill to oxygen while also keeping the lid shut. Keep both your intake damper and your exhaust dampers wide open. During the main part of cooking, you will probably need to cool the temperature a little (although this will depend on what you are grilling). You won’t want to completely starve the charcoal of oxygen though, so try closing the vents either halfway or three-quarters of the way shut. This will limit the flow of oxygen without completely stopping it, therefore bringing down your grill’s internal temperature slightly. This should help you achieve the magic 225°F number that is often needed for proper meat cooking. I recommend keeping the setting on both the intake damper and exhaust damper the same while you do this. You don’t want more air to escape than you can allow going in. If however, you think the inside of your grill is getting too smoky then open up the exhaust damper a little more. Once you have finished grilling and want to extinguish the charcoal, then you need to close the grill lid and also shut both vents completely. If you find that you need help regulating your vents, then an automatic BBQ temperature smoker is a great tool to help maintain consistent cooking heat levels. 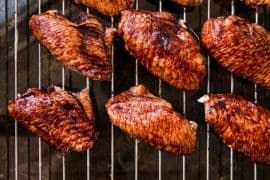 How do grill vents help regulate temperature? Your charcoal grill’s vents help control temperature by regulating the flow of air both in and out of the grill. Oxygen is what feeds your charcoal - too much and it will flare up, too little and it will extinguish. 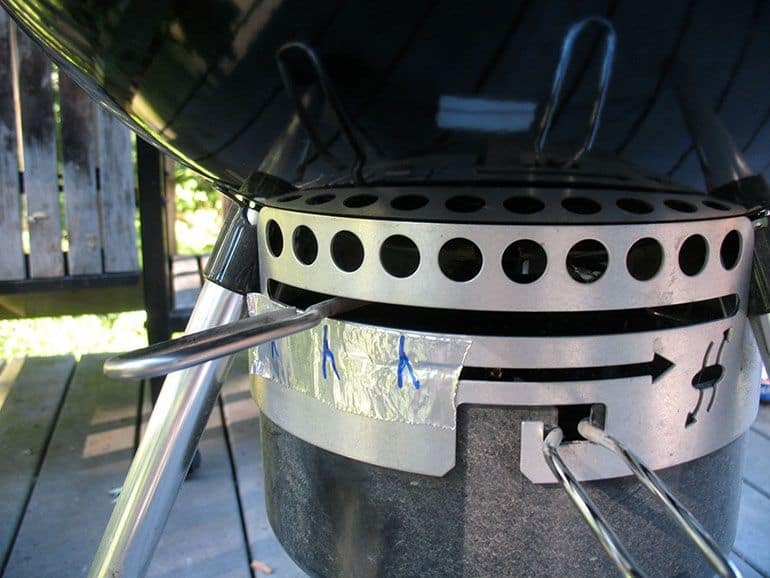 Your grill should have two sets of vents - one set at the top (usually on the lid), and the other set at the bottom. These two sets of vents work together by air flowing in through the bottom set, called the intake damper, and then out through the top set, called the exhaust damper. Both of these are really important, as it’s the intake damper that actually feeds your grill with the fuel it needs, while the exhaust damper not only aids airflow but also allows smoke and excess heat to escape from the grill chamber. It’s important that you allow both of these sets to work together to allow good airflow through your grill, but also to control the internal temperature of your grill. They need to work in tandem, and one can’t work without the other. In fact, if you learn to master your vents properly, you can even turn your grill into a smoker. How does grill airflow work? When the intake damper is closed, air cannot enter the grill. This cuts off the oxygen supply to the charcoal, which in turn means the flames will extinguish and die out. If only the exhaust vent is covered, smoke and heat will build up. This will prevent more oxygen from entering the grill, which will cause the flames to die out. The more air flowing through the grill, the higher the temperature will be. The less air flowing through the grill, the lower the temperature will be. The aim is to create a healthy airflow that allows continuous heat, but without causing any flare ups or excessive heat. 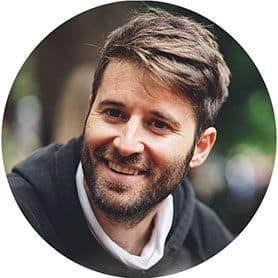 What else can affect charcoal grilling? Mastering temperature control through your grill’s vents isn’t the only thing to consider when grilling. Here are some others that you need to take into account. With airflow being so crucial to charcoal grilling, it stands to reason that exposure to wind can have a significant effect on your cooking. It will affect not only the airflow through your vents, but if your grill surface is exposed at any point then it can be vulnerable to changes in wind speed and direction. This could increase the strength of your flames significantly, or the wind could be so strong that it extinguishes your grill completely. Ensure that the physical location of your grill is well guarded against this. Some people like to place their grill on their patio behind their house, while some build a brick windguard around their grill to protect them from the elements. Grills aren’t indestructible, so wear and tear does happen over time. 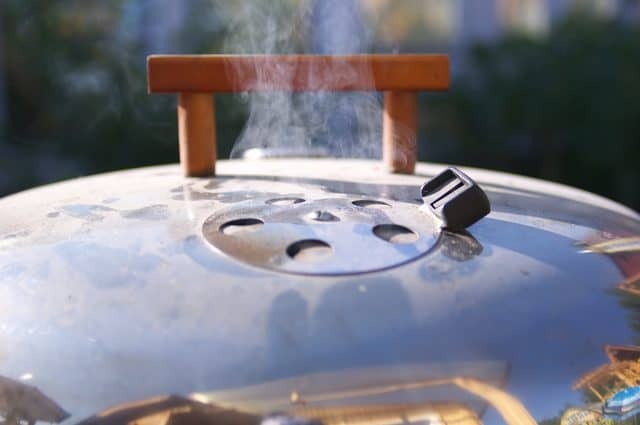 In the case of charcoal grills, it’s not uncommon for older models to rust or crack, leaving them vulnerable to air leaks, particularly around the rim of the lid. This in effect provides another vent, which means that more air could pass in or out, even if your main vents are closed. This can disrupt your grill’s temperature, and potentially ruin your grilling. You can make a temporary fix by using some silicone sealant that’s safe to use around food and cooking areas. However, I would recommend looking at a permanent solution in the form of a new grill. The quality of your barbecue will only ever be as good as the charcoal you use, so if you’re using subpar fuel then you will only get subpar results. Avoid the temptation to use cheap briquettes, and instead get good quality lump charcoal. These are much purer in ingredients than briquettes, and contain far fewer fillers. This means you will get much cleaner smoke, meaning your food will taste far better. They will also burn far longer, which means you won’t have to disrupt the airflow of your grill by opening the lid to replace the charcoal.